McDonald's is giving away free chicken sandwiches today in over 14,000 US locations. 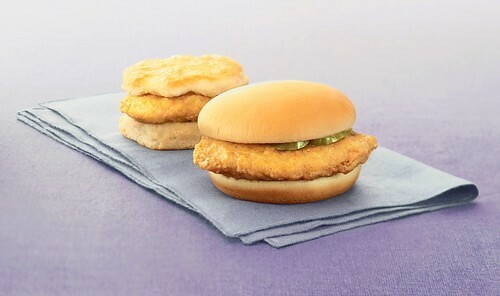 It's all part of the launch of two new chicken sandwiches: the Southern Style Chicken Biscuit for breakfast and the Southern Style Chicken Sandwich for lunch and dinner. If you visit McDonald's between 7:00 and 10:30 a.m. today, you can get a free Southern Style chicken biscuit with the purchase of a medium or large drink. If you miss breakfast, you can still get a free Southern Style chicken sandwich, which comes garnished with two pickles, until 7 p.m. If a chicken biscuit for breakfast sounds familiar, that's because Chik-fil-A has been doing it for over 20 years already. But can chicken for breakfast succeed outside the South? In the South, chicken for breakfast has long been popular, as have simple-but-hearty fried chicken sandwiches like Chick-fil-A's, said West of Stifel Nicolaus. "People in the South love this stuff. The wild card is, will this do as well in the North, in Chicago or Michigan?" McDonald's says it has extensively tested its Southern-style items in the North, as well as the South, and that both went over well. For those who think chicken for breakfast might sound bizarre, McDonald's Thoma pointed to the McGriddle.